In fitness, flexibility exercise is one of the four main types of training, along with endurance, strength and balance exercise. Each of them provides different benefits to your muscles, joints and bones, and should be included in a complete workout routine. However, not all four types should be practiced every day; the best approach is to keep your workouts varied by alternating between these types and combining two or three of these forms of exercise in the same routine. Generally, flexibility is defined as the range of motion in a joint, however when we refer to flexibility exercises, it’s not just the range of motion in joints but also the flexibility of muscles that is targeted. The latter may also be referred to as stretching exercises, the purpose of these movements being to elongate the muscles and improve their range of motion. As the name implies, flexibility exercises keep your body flexible and although they don’t have effect on muscle strength or endurance, they help by giving you more freedom of movement and allowing you to perform more complex and challenging workouts, thus keeping your body slim and strong. Also, flexibility exercises help in minimizing the discomfort during strength and endurance workouts, and are especially useful for people with sedentary jobs or for those who spend a long period of time confined to bed due to injuries. Flexibility exercises are best done when the muscles are already warm, and walking or jogging in place are good options for warming up if you’re preparing for a flexibility workout. To make sure you avoid injuries, stretch slowly and stop if you feel that a certain position or exercise it’s getting uncomfortable or causes pain. Try to hold the stretches for 10 seconds if possible – the more often you practice, the more flexible your muscles and joints will become in time. Repeat each stretch 3-5 times until you feel you’re getting more flexible and can reach farther in each exercise. 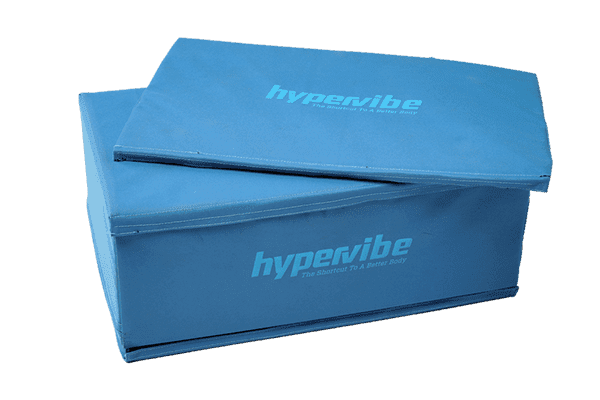 Unlike conventional flexibility exercises, stretching on the Hypervibe machine has the advantage of mixing this form of exercise with strength training, so besides making your muscles more flexible, WBV stretching also helps you build a stronger body. 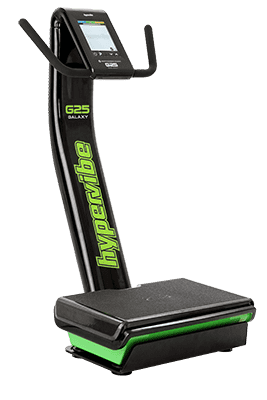 Some of the benefits you can expect from stretching on the Hypervibe machine include increased range of motion and flexibility of muscles, increased blood circulation and supply of nutrients to joints and tissues, better stability and decreased risk of injury. WBV stretching also helps in reducing muscle tension, decreases low back pain and relieves muscle cramps, helps in improving balance and posture and improves coordination. Given below are some stretching exercises you can do on a Hypervibe whole body vibration machine. In some cases the movements can also be done on an exercise mat, without special equipment. For each of these exercises, hold the stretch for 10-15 seconds and repeat the movement twice. You might feel some discomfort if your muscles aren’t that flexible, but you should stop if the stretches become painful. Try to inhale and exhale normally during the exercises and to maintain the right posture. This exercise targets the shoulder muscles and is done by pressing while pulling the opposite elbow towards the opposite shoulder. 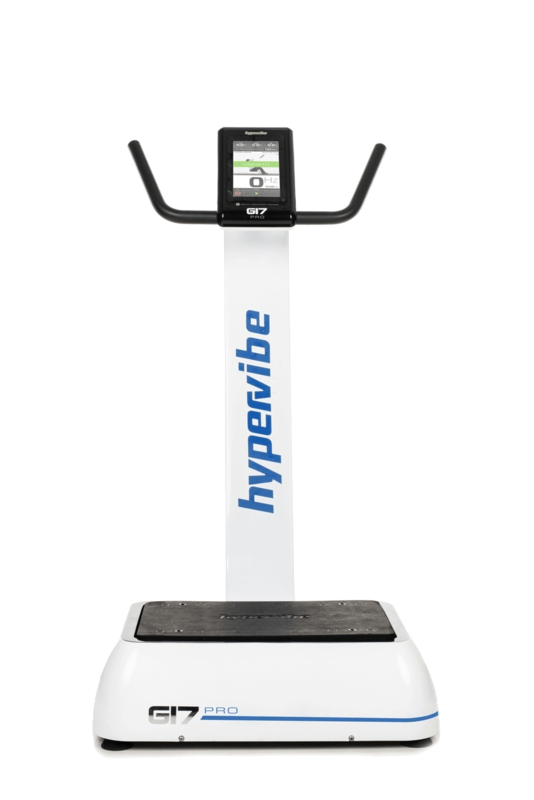 You can do the exercise on the Hypervibe machine, standing in the basic position, and setting the frequency at 10-12 Hz, or on the exercise mat. 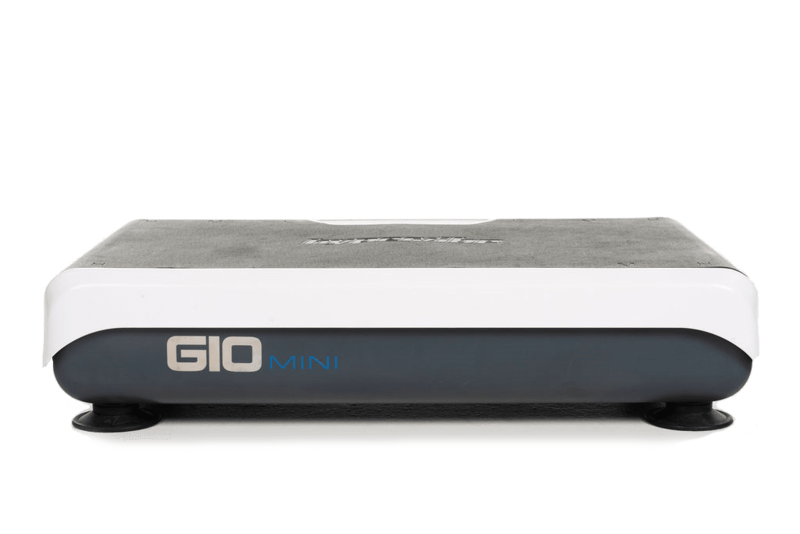 Stand on the vibration platform with feet at #1 and set the frequency to 12-15Hz. Keeping the legs extended, place your hands on the machine’s handles for balance and bend forward, bringing your chest towards the knees. Avoid rounding the back and don’t bring the head too low. Maintain the position for 1 minute, then switch to the hamstring massage for 30 seconds. If you prefer you can do the hamstring stretch on the exercise mat as well. Bend one leg and keep the other leg extended, in front of you. The leg that is bent should be positioned against the ground. Pull the toe towards your body, to really extend the muscles, and maintain for 10 seconds. Repeat the stretch 2-3 times. Stand on the platform with your feet at #2 and set the frequency to 12Hz. Extend your arms overhead and lock the hands. Without twisting your upper body, bend to the left side, slowly, keeping the core muscles engaged. Hold for 1 second then return to the upright position and bend to the right side, as slow as you can and without rotating the trunk. Repeat the exercise for 1 minute. This movement is effective for improving the flexibility of your waist. This exercise can be done while standing and holding one of your feet wit both hands, or on the Hypervibe machine, at a frequency that allows you to maintain balance and proper posture. For more flexible back and shoulder muscles, try the cat and camel stretch. Kneel in front of the vibration machine and place your hands on the platform at #2. Slightly bend the elbows and arch your lower back, allowing the pelvis to drop. Hold for 2-3 seconds, then round your back with slow movements, extending the arms and keeping the knees bent. Do the exercise with gentle and slow movements, to feel the stretch in the target muscles, but don’t force the back if you’re not that flexible yet. Your lower, middle and upper spine should feel comfortable, not painful, during this exercise. Repeat the stretch for 1 minute, at a frequency of 10-12Hz. 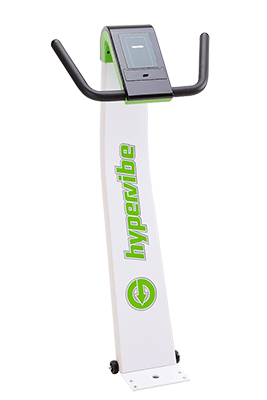 Stand on your Hypervibe machine or on the exercise mat and push against the ground or platform. Do this exercise for 1 minute. Reach your left hand behind your head, grasping the elbow and gently pulling it. Hold for 10 seconds, then switch sides and repeat the exercise for 1 minute. You can do this exercise in the basic stance on the WBV machine, at a frequency that feels comfortable, or on your exercise mat. Place one leg in front of the machine with the knee bent, and the other leg on the machine. This position will stretch the hip muscles, so lower the pelvis as much as possible while maintaining the knees bent and the back straight. Maintain for 1 minute per leg. Below is a complete Hypervibe whole body vibration routine for improved flexibility. Have something to add to this article? Comment below or join our Facebook community and share your thoughts with us!